This guide is primarily intended to help restore mSATA images for the ct521 or the ct920 as they do not have video output. It goes through installing a LANforge disk image onto a mSATA drive via Linux or Windows, and then configuration of the LANforge system. Download the f24-msata-28g-img.bz2 image. The username and password is guest/guest. Follow the below guide for installing the image using Windows. 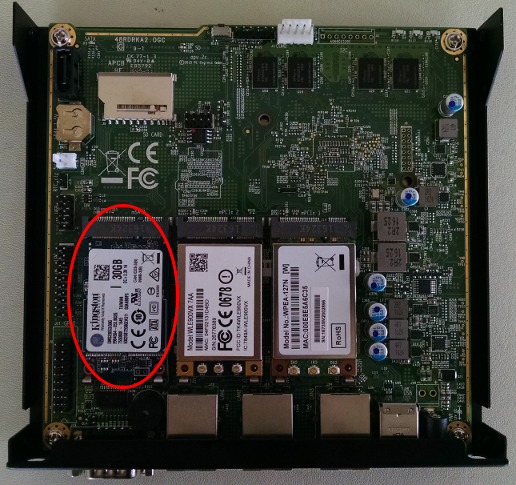 Connect the mSATA adapter with the mSATA drive to the Linux system. You can use the dd utility on the command line. Make sure to replace /dev/sdc with your device! Note: This command can take a while to run (roughly 20-25 minutes on USB 3.0 or 1-2 hours on USB 2.0). Remove the mSATA drive from the USB adapter and place it into the desired system. Note: The system will not function correctly if you try to boot off the mSATA while it is in the USB adapter. The above picture is from a ct521 system. Connect to the LANforge system via serial connection and log in. Configure the LANforge system for internet access. Make sure just one ethernet cable is plugged in. For the ct521 system, use the leftmost port. Use the command ip l show. One port should show 'UP' as seen below. Use the command dhclient portname where portname is the port found above. Verify an IP was obtained with ifconfig portname. Update the system and reboot. After rebooting you will need to run dhclient again to get an IP. Run the lf_kinstall script to configure LANforge software. In the serial terminal, copy and paste the below command. Run lf_kinstall again with do_grub option. This makes kernel options show up on boot. Note: The options should normally show up on the first lf_kinstall. We are currently looking into this. The license can be installed via the management GUI under the Control->Install License file menu. Set firmware for ath10k radios (skip this step if there are no ath10k radios). 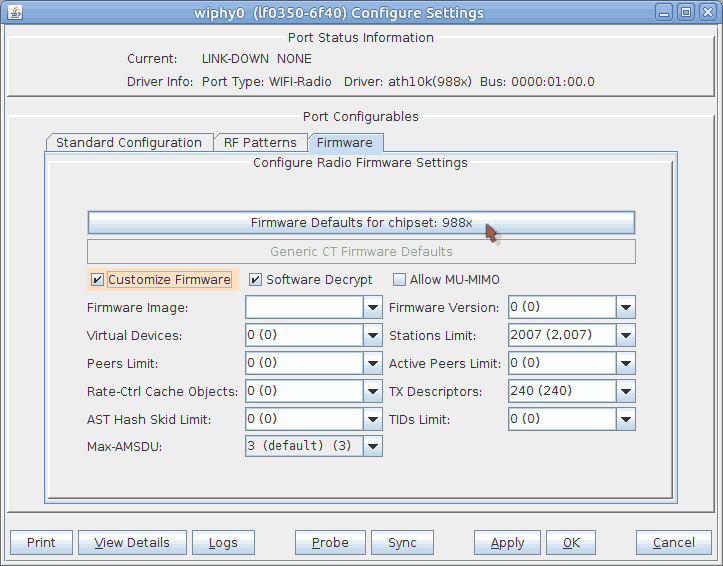 In the management GUI's Port Mgr tab, Modify the wiphy port of the ath10k radio(s). In the firmware tab, click Customize Firmware and then Firmware Defaults for chipset: 988x. There are likely to be some phantom ports in the Port Mgr tab such as enp2s0 and enp3s0. These can be deleted as they are just remnants of ports that have been renamed. All set up! If you have any questions or comments, please contact us at support@candelatech.com.